This post on read write web introduced me to the new network Open Coffee Club(OCC). 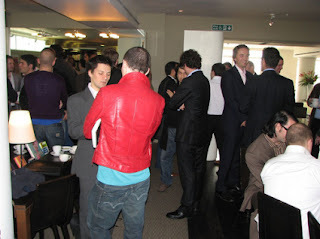 According to Ning.com Open Coffee Club stands for "a place for people who love startups to hang out and meet". In words of David Lenehan "The OpenCoffee Club started as an attempt to establish recognized, open and regular meeting places where entrepreneurs can meet with investors in a totally informal setting." A brain child of Saul Klein based in London, a venture partner at Index Ventures and a VP of Skype. It all started in March this year. For details on what OpenCoffee Club is all about check out this post by Saul Kelin on his blog. To know more about the happenings keep tuned over here . The concept is simple, events are arranged at a predefined venue and a predefined time where entrepreneurs and interested people come over to chat, discuss their ideas, and most important of all build relationships. It's not just the entrepreneurs who come but also the VC's (the people with power!!). This gives the entrepreneurs a chance to pitch their ideas and see if the VC's might be interested in them. The best part, all of this happens informally, no boardrooms, no presentations. Check out the thoughts behind OCC . I know by now you are excited about all this and just screaming at me where do I find an OCC? Is there one near my city? To answer you, since OCC started in London, there are now over 39(as of writing) locations across the Globe. Check them out to see if your place has one. Don't find your city? Nothing to worry, you can start one. Just get started and get in touch with Saul. For all those in Bangalore, I have created profile for myself on OCC. Also started a discussion titled "Coffee in Bangalore." I see an encouraging response and plan to kick start the first meet next weekend. If you are interested drop a mail or a comment to this post. I will keep you folks updated on the happenings. So, what are you waiting for, get this kicking, this is your event, this is your future. Credits: The First photo is by David Terrar, the second one is by Jason Mendelson. Update: Folks from Bangalore, we now have a Open Coffee Club Bangalore group on Upcoming. Join that for keeping up to date on the happenings. 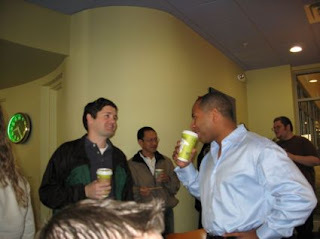 Open Coffee is on a regular basis where entrepreneurs, investors come together and chat over informally. (~2hrs, once every week, or two weeks). So,is it like a platform where money meets the idea? Or jus people with similar interests trying to help out each other? Thanks Saul. We are planning it for 19th August 2007.!